The emergence of the Intermountain West as a hotbed for progressive transportation initiatives continues. The latest example is Phoenix, where the new light-rail system is a big hit—bringing good news to a state facing a $1.5-billion budget deficit and some of the nation’s worst readings on economic recovery. Even before the Phoenix start-up, the vast, multi-metro “Mountain Megas” of the Rockies boasted two of the nation’s most successful rail-transit efforts—FasTracks in Denver and Trax in Salt Lake City. Both systems represent bold and self-conscious efforts to move people, yes, but perhaps more importantly to retrofit the auto-scape through the urban therapy of transit-oriented development. Coastal sorts have been surprised. And now comes Valley Metro in Phoenix, one of the most apparently unpromising locations for transit of all, and it’s working, though not quite the way transit does in, say, New York, Boston, or Washington. Every day, Valley Metro attracts some 33,000 riders—way above the 26,000 that were originally projected. But what’s especially interesting is the clientele. Unlike systems elsewhere, which are used principally by commuters, the 20 miles of rail in Phoenix running along the central spines of Phoenix and then through Tempe to Mesa are used largely by students shuttling between Arizona State University’s downtown and Tempe campuses, and people going to restaurants, bars, ball games, and cultural events downtown. 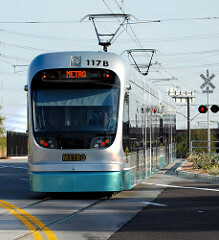 Only 27 percent of the system’s riders use it for getting to work (compared to 60 percent elsewhere), which suggests that, for now at least, the Phoenix light rail will flourish as a sort of jitney service supporting a post-industrial metropolis’s ongoing cultivation of a classic entertainment district downtown, higher education there and in Tempe, and associated nodes of new and intensified development along Central Avenue. The system is also creating a deeper transformation. 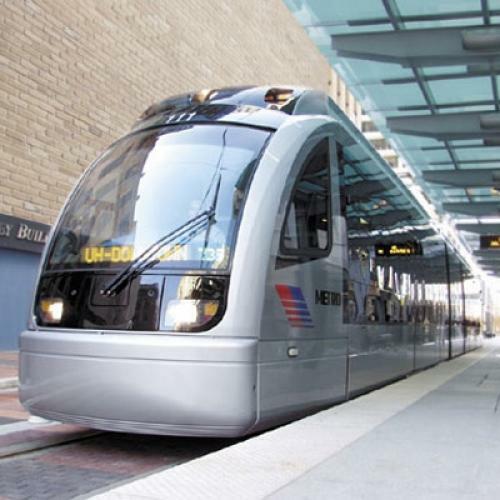 Since 2001, when the tax for the new $1 billion transit system was approved, there has been about $5 billion in public and private investment—$3.5 billion of it private—along the light-rail corridor and its cool stops, according to a recent story in The New York Times. The system seems to be delivering day-to-day economic benefits, too. According to the Times, downtown Phoenix saw its revenues increase 13 percent in the first quarter of 2009, while the rest of the city saw a revenue decline of 16 percent. In short, light and commuter rail is working in Phoenix, and across the Intermountain West, but not exactly in the same way it does elsewhere. Younger, with less-extensive networks, and situated earlier in their metros’ buildout, the Mountain West systems don't alleviate traffic so much as carry out what Virginia Tech’s Rob Lang calls “urban shock therapy” in suburb-dominated megapolitan areas. These systems appeal to and showcase an emerging new orientation toward denser, mixed-use development in hitherto sprawling metros. As they do, they further whet the appetite for traditional urban living in a region known mainly for horizontal sprawl. Or at least, that’s the way it seemed one recent afternoon as I rode one of the sleek turquoise new Valley Metro cars from downtown to Tempe, listening to two middle-aged guys talk amiably about Alice Cooper’s sports bar in Phoenix while a heavily tattooed young woman affected her best public-transportation blank stare as we rolled along Washington Street. Urban shock therapy has begun.